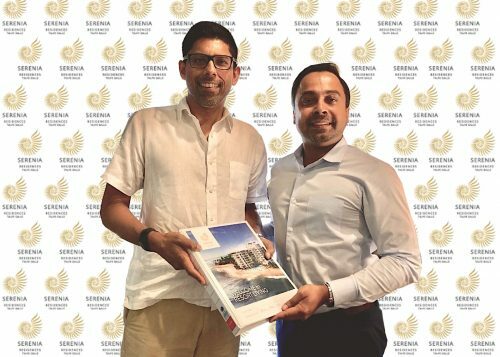 Director of Dilmah Tea and Managing Director of Resplendent Ceylon, Malik Fernando, sees great value with his recent purchase at Serenia Residences. Dilmah Tea; a global leader in tea is a family-run Sri Lankan tea company founded by Merrill J Fernando. The company is well respected for its philanthropy; funding humanitarian and environmental projects in Sri Lanka. Resplendent Ceylon, the leisure arm of Dilmah Tea, has created a collection of small luxury resorts that offer a unique trail across Sri Lanka offering the upscale traveller a range of experiences linked to Sri Lanka’s history, culture and nature. Cape Weligama, Wild Coast Tented Lodge & Ceylon Tea Trails belong to the Resplendent portfolio. Commenting on his purchase, Malik Fernando added; “I am delighted to invest in a residence at Serenia. The location is perfect, just 10 minutes from the Galle highway exit; the beachfront property in Talpe is as good as it gets. Rates starting at US$250 per sqft makes for a good investment. I was glad to note the developer’s attention to detail so am confident a quality product will emerge. The contractor is Access Projects who built Cape Weligama and should do a good job, adding their experience of developing by the ocean. Saving the upcoming 15% VAT was a bonus, translating to quick capital gains after the 1stof April. I look forward to enjoying Serenia when the apartment is ready at the end of the year”. Once completed; Serenia Residences will consist of 47 fully serviced residences located on the ‘Million Dollar Golden Mile’ in Talpe Galle, only 8 km from the Galle Fort. Complete with designer Camagni Italian kitchens with built-in Electrolux appliances, 10-ft-height floor-to-ceiling double glazed windows, Bohemian hand-blown crystal chandeliers, Hansgrohe and Duravit bathroom fittings, Italian homogeneous tiles, outdoor yoga studio, an outdoor cinema, kid’s play area with day care, carwash facilities, an oceanfront deck and spacious private cabanas, heated jacuzzies, beach concierge services, 24-hour attended lobby, 24-hour valet parking services, and many other facilities and amenities. Prices start from $ 320,000 for a 1,307sqft 2 bed, US$506,000 for a 1,827sqft 3 bed and US$1,165,000 for a 4,480 Sqft 3 bed Penthouse. “Customers who invested at the launch of the project are already enjoying 25%-30% capital appreciation on current price of the similar unit. We anticipate that at the time of completion the development will give customers who buy a unit this month a 30-35% USD capital appreciation plus the 15% saving from the VAT, which will account for approximately a 50% increase in USD capital appreciation. Due to the unique concept and location of the project combined with a limited number of units available the prices are increasing every 3-4 months by 15%. As an owner of one of the residences, you will have the unique opportunity to place your luxury residence in Rental Management Program which offers a rental return of 7-10% USD return per year. Clients who have purchased at Serenia are 65% foreign and 35% local HNWIs; and they strongly believe in Sri Lanka’s south coast as they confidently add Serenia Residences to their investment portfolio, making it a product that will always be traded in US$s. Due to the managed rental program clients will earn in US$s as well mitigating any local currency volatility, we offer the perfect platform to trade & earn in dollars” added Dilshan Kodituwakku, Executive Director Serenia Limited. Set to develop and strengthen the Sri Lanka's ultra luxury holiday home sector, Serenia is focusing on a specific message this year "Own your place in paradise". Find out more www.sereniaresidences.com or call 0770 380 280.